ARRRRGGGGHHH !!!! Join us as we pilage and plunder the Exuma chain of islands in the Bahamas. 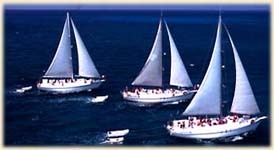 We set sail aboard Blackbeards cruises and enjoy the treasures the sea has to offer. You will book your own airfare. ONLY 10 SPOTS LEFT ! The diving here is some of the best in the Carribbean. 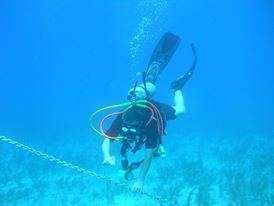 The chain is made up of over 365 islands or cays, so the diving here is varies from shallow reefs to walls plunging to over 400'. In amongst these islands we will have the opportunity to see a few blue holes as well. The visibility is extremely good here being 100'+. A few of the islands are actually movie sets like to one used in "Into the Blue" where they hid the treasures. Or just hang out and see what swims your way and watch the movie!! 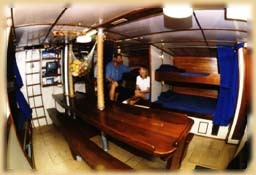 While the boat may seem small when you first board, once everyone gets their stuff put away and their bunks made it really is very ample room. There is some storage below the bunks for collapsable bags and a shelf at the head side of the bunk for some everyday stuff. There are 3 "heads" one with a shower. You have 30 sec of fresh water daily to shower with. In trip past we have taken solar showers and used the condensate water which you can have all you want. After a few days the topside starts to look like a chinese junk with the towels and bathing suits pinned to the railing to dry. There are 110v recepticle so charging your batteries for cameras and lights is no problem. The boat is air conditioned all the time except while cooking they turn off the forward 2 cabins just during that time. There is storage for your gear topside in the seats, although once you put your BC and Reg on a cylinder you just leave it assembled all the time. Secure your spot TODAY with a $250 Deposit per space.